The intrepid crusader from the north cut to the heart of Obamacare a year ago, slashing through the professor-speak and government gobbledygook with a searing summary on Facebook of its bottom line: “death panels.” With those words, the grounds for debate had shifted, the mainstream media ideological blackout was circumvented, and now, although it may have been Obama’s new head of Medicare, Harvard’s Dr. Donald Berwick, who stepped on the shuttle at Boston’s Logan International Airport, it is Darth Vader who has exited at Reagan National. Darth Vader — really? The man responsible for the death of a gazillion inhabited worlds, through whom the evil Emperor Palpatine — described as ” a middle-aged politician … who gains power through deception and treachery“…sound familiar? — sought to enslave the universe in the fictional Star Wars saga? Surely, an exaggeration! Yes, and deliberately so, for Berwick starts off his gig as head of the Centers for Medicare and Medicaid as an enthusiastic proponent of, as one British media commentator noted, a system that routinely denies “some poor suffering victim a remedy that is available in other countries.” At the same time, it views the elderly as simply less worthy of care, an expendable segment of the population for whom doctors and heart specialists provide less treatment past the official “cut-off” of 65 years, a British health research journal documented. Sarah Palin was right, stubbornly hanging in when the mainstream media — sensing “a great disturbance in the [leftist] force“ — trained its batteries on her. 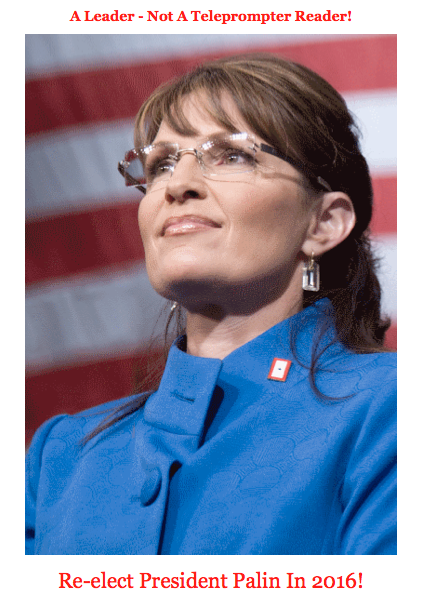 She was ridiculed on network newscasts, in the White House briefing room, by the media “stormtroopers [who] represented the most visible extension of Imperial [Obama] might.” Darth Vader and Star Wars serve as metaphor, Palin as Princess Leia, while network anchors, commentator after commentator, all the president’s men showered ridicule on her. “Downright evil,” screamed Keith Olbermann; “stupid as s**t,” proclaimed a popular Democratic blog.